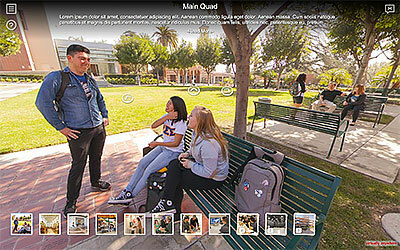 Virtually Anywhere creates comprehensive 360 degree college campus virtual tours for any size college or university. 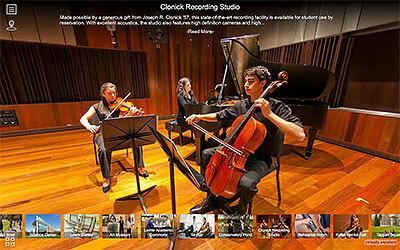 Our virtual tours provide prospective students and families an immersive, online experience of campus life and more. 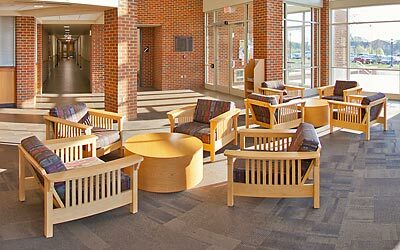 These beautiful, interactive tours not only showcase all aspects of campus living, but are also used to highlight academic departments or athletic programs for recruiting prospects. 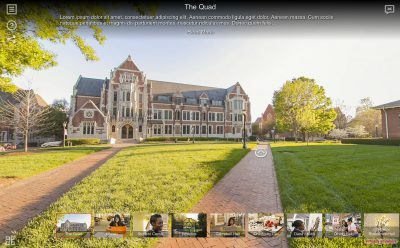 Virtually Anywhere’s college campus virtual tours are a UNIQUE and AFFORDABLE medium to display campus life around your academic institution. 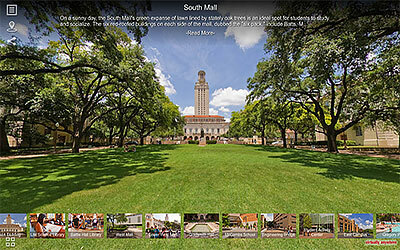 Our higher education virtual tours are a turn-key solution for colleges wishing to create a campus virtual tour. 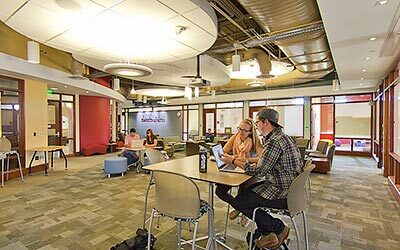 These virtual tours include embedded hotspots that link to web pages, presentations or videos to encourage interactive learning about your campus. The online tours are modular, allowing new features or updates to be made to existing virtual tours as your campus grows. With nearly two decades of virtual tour experience, we have created an efficient production process. Our modular approach allows us to be nimble, flexible and scalable in how we meet our academic customers’ needs.